I'm pretty sure the Playmates Enterprise-D wasn't around yet when BoBW was filmed. 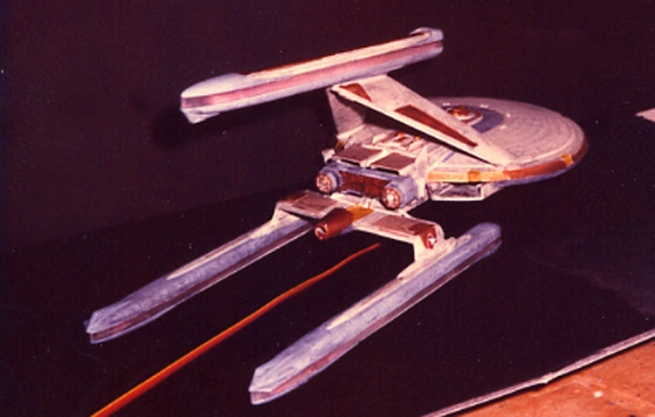 The AMT model kits were literally brand-new at the time, much less any toys that accurately represented the ship in that size. The Playmates Enterprise D came in 1992 or 93, so it is certainly not in the running. Nope. 1/2500 Galaxys had integral all the way. Hey all - Valdore over at Starship Modeler found the "coffin box" piece used on both the Chekhov and the Nebula prototype. Link here. The link asks for a username and password. Ok. So it's 5am. I should be sleeping, but couldn't. So, what better way to to pass the early hours than googling old toys from my childhood. Y'know, as you do. Anyhoo. Long story short. I found the USS Chekov's pod!!!!!! Of note is the cranes arm. That's where the part is. Originally, seems the part was a dark, smoked piece. That's seems to have the scribe lines, hinge, and the square detail underneath, exactly matching the Chekov's pod. Awesome. I Wonder why they only used that piece though? Bloody thing is packed with usable greeblies. Thanks very much! I can't take full credit for the find, though. Valdore did most of the heavy lifting. 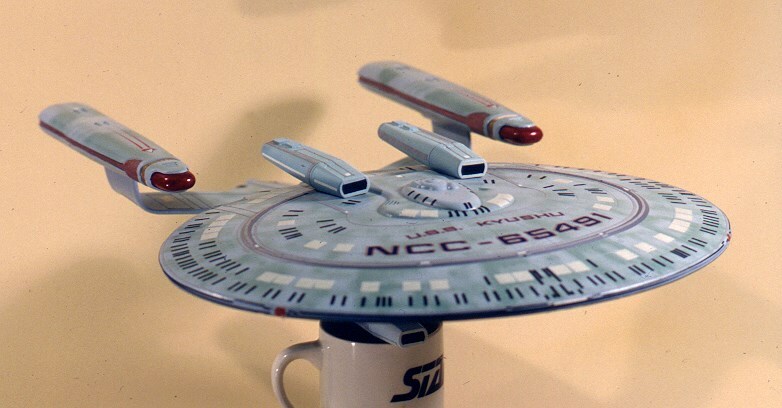 In other news, Eaglemoss has released a pic of the New Orleans-class USS Kyushu prototype. Aside from the grid lines and escape pods from being a little overly-pronounced for the scale, it's quite a faithful representation. Quite amazing, considering the analog nature of the source material. Also note it's sitting on a mug, not unlike the original. Someone at Eaglemoss has really been paying attention - LOVE these guys! That's the pod/cockpit, all right. And it'll probably be next to impossible to find. It's a part from the Robotix toys. I found them on eBay, but the seller didn't only sell one, so I ended up with like 15 of them, lol. Maybe I can sell them to people who want to build a replica. Okay, I was trying to avoid and/or divest physical models in favor of digital ones, but I am afraid I will have to own the New Orleans Class. We all have our favorite non-star ships and that frigate is mine. Of course, I prefer her without what I imagine to be the special mission pods, but whatever.